Please note that these dates are not guaranteed unless started otherwise. Our standard turn around time is 2 weeks. To not incur any rush fees, please have your order in no later than Monday, November 10th. If you can’t meet that deadline, we also do rush orders — which can be about an extra $2.00/piece. It’s important to remember that the holidays are an extremely busy time for all shipping companies. Once the order has been shipped, then the order is now in the hands of the shipper and there is nothing else we can do. Please be aware that unexpected delays, such as weather conditions and delivery route changes, can happen and may delay your expected delivery date. We encourage all our customers to purchase their gifts as soon as possible and not wait last minute. 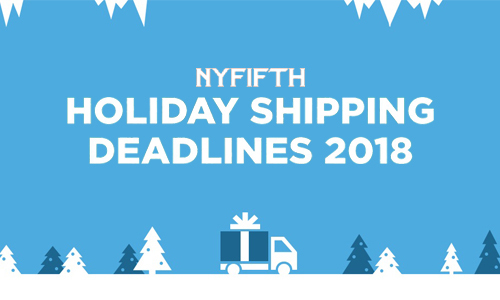 If you happen to be tied-up at the office or have a busy schedule that you need to order last-minute, please follow the above shipping dates to make sure your order gets deliver to you in time! All our blank orders are processed and shipped out the next day from the closest warehouse to you. If you’d like to find out which warehouse the item will be shipping from, you can speak to a customer representative at (877) 695-9722.